NüWorks is still within its first year but the business is growing and I am happy to welcome the new partner Lionel Bikart who joined NüWorks in July. 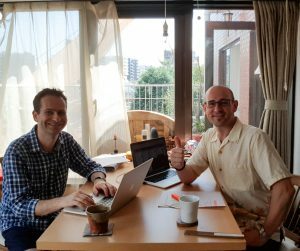 Together with Stefan Nüsperling, both are building a strong and complementary team to make NüWorks thrive sustainably and accomplish its mission to bring happiness and positiveness at workplaces in Japan and worldwide, inspiring new innovative and energizing ways of leading organizations. Based on scientific research, especially learnings from positive psychology, NüWorks offers corporate training, workshops, coaching, facilitation and consulting. Stefan’s main focus is Management 3.0 as well as Agile Leadership training and facilitation and Change Management for Company transformation. Lionel will complement the business with executive and leadership coaching as face-to-face or online sessions supporting managers, leaders and their teams to strengthen their leadership and intercultural competencies. 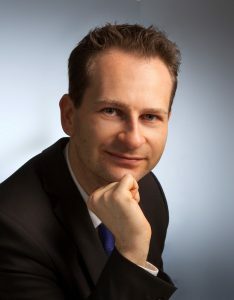 As an international leadership and executive coach, member of the International Coach Federation – the major professional organization of coaches worldwide – and ACC credentialed by ICF (Associated Certified Coach), Lionel is passionate about supporting managers and leaders who decided to strengthen their leadership and intercultural competencies. Lionel’s areas of expertise spans from individuals to their team. Grounded in openness, curiosity, authenticity, positivity and creativity, Lionel’s coaching approach sharpens the executive’s understanding for his/her functions and strengths, ensures value-based decision making and promotes the emergence and reinforcement of successful leadership practices and leadership attribution in the context specific to the client. Lionel has coached clients ranging from executives, middle management and entrepreneurs from various countries in English, French or German, working for diverse manufacturing and service organizations in the public, private, and non-profit sectors. Coaching focused on intercultural competencies inspires more effectiveness in multicultural diversified teams in both home and foreign country settings and ensures a thriving expatriation/ repatriation experience. In other words we will serve our clients with a more comprehensive leadership and management service which ranges from team training as well as coaching to individual leadership competence development. I welcome Lionel to NüWorks and looking forward working with you! Japanese Moving Motivators Game is Now Available!